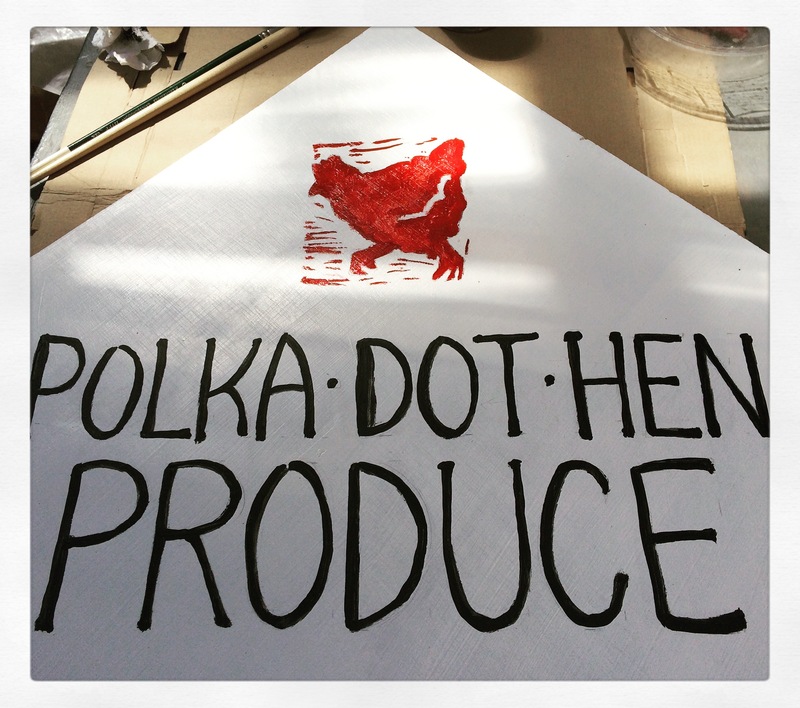 First day for Polka Dot Hen Produce at the Wiarton Farmers Market. 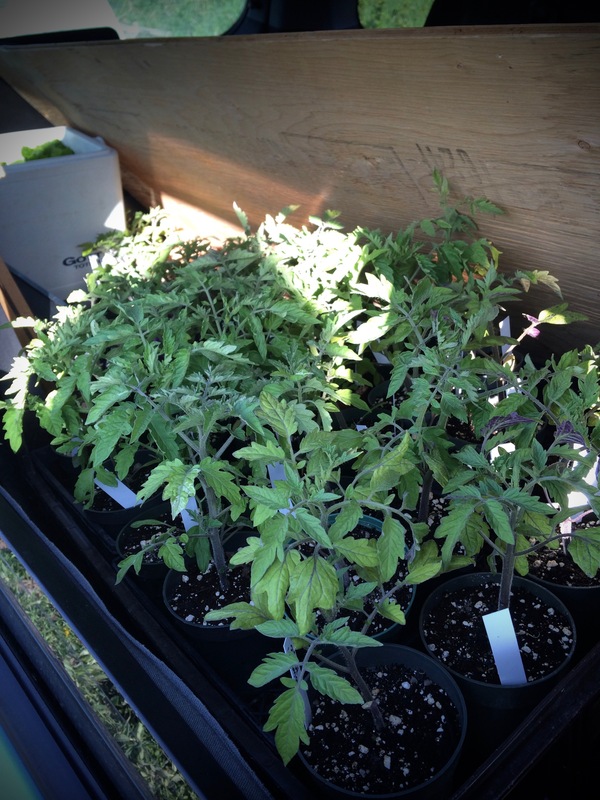 We sold tomato seedlings, herb divisions and herb bundles. Glad I had my helper/photographer along! The other vendors were welcoming. What a nice start to our season. Spring was definitely in the air, so many folks at the Wiarton Farmers Market were ready to talk gardening. It was really fun to geek out on the heirloom tomatoes. Customers were interested, or at least very kind, and let me prattle on about the wonders of Saint Pierre, Cherokee Purple and Matt’s Wild Cherry. I also learned some great new tips for using catnip and lemon balm. I could have easily spent all my earnings with the other vendors at the market. Vending next to the chocolatier…deadly. And so good. I will have to pace myself. However, there was quite the wind-up before this long-anticipated day. So many things to learn, so many things to consider. Where to start? First of all, there were all of the logistics of looking presentable as a business. Winter was a great time to search the world of Pinterest for perfect and unattainable market display ideas. Did you know that farmers market-themed weddings are super popular? I did not. Finally, I filtered out one display idea that looked really nice, but also on my scale – with the number of “staff” available to me. So, I totally stole the foundation of my market table from the folks at Tiny Farm. Then I fell in love with their blog. A trial run of our market stall to see how everything looks. 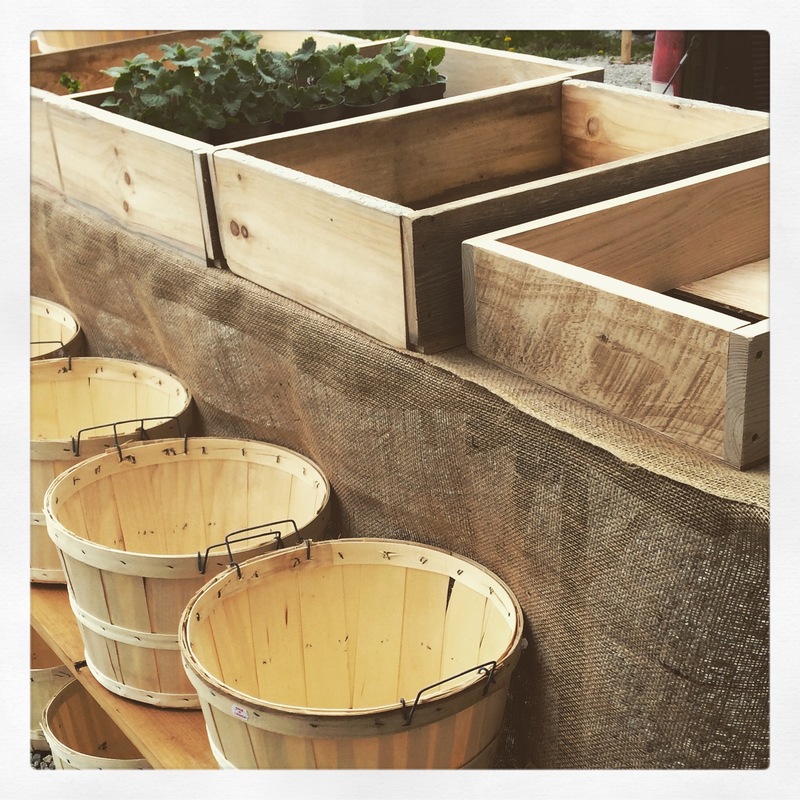 Can’t wait to see some produce in those containers! Thanks to the awesome man of the house, I have these beautiful wooden crates to work with. They nest inside each other to save space in the car. They really lend a rustic feel which represents our microfarm and lifestyle well. I was so excited to have an excuse to order one-half and one-quarter bushel baskets. They are quite adorable. Then, there was the whole signage thing to figure out. We really aren’t fans of heavy-duty chemicals, so it didn’t seem right to have a big ‘ole vinyl sign touting our name. Again, we looked around and came up with a hand painted sign that fits well with our “vibe”. It needs a few finishing touches…but who doesn’t? This hand-painted sign almost sent me over the edge. My paint brushes were far from pristine and added an element of danger that my nerves could have done without. 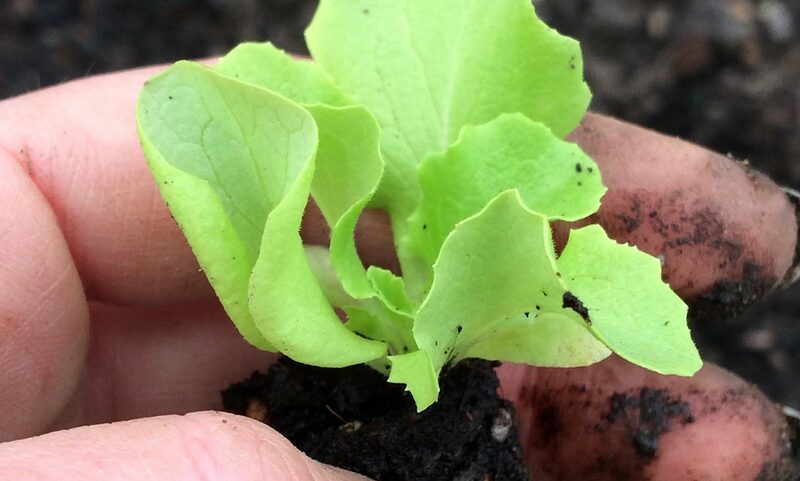 Remember those little seedlings we started in March? A couple days after the peppers were seeded, I seeded the heirloom tomatoes. I have been babying those plants for months now; watering, potting up and protecting them from the cold nights we had well into May. It was fun and a little nerve-wracking to think of transporting them into town for the market. I shouldn’t have worried though, they are sturdy little dudes. Getting them to fit in the car was another puzzle to piece together. It took some creative thinking to get the display table and all of the tomato seedling flats in to the CRV. So if you are in Wiarton on Friday between 10 am and 2 pm, come on down to the Farmers Market and say hello! 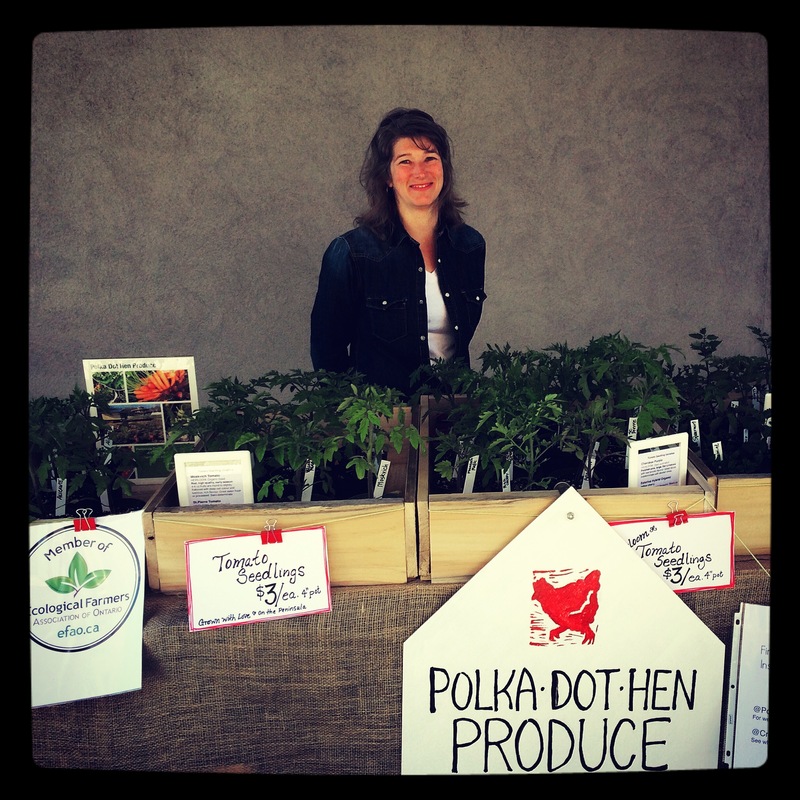 We’d love to meet you…and talk tomatoes!